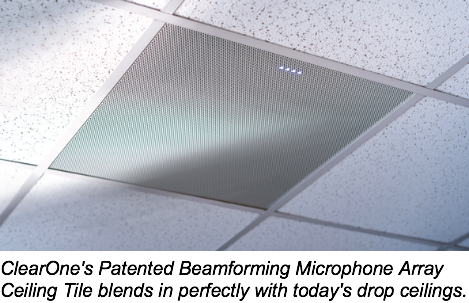 ClearOne, a leading global provider of audio and visual communication solutions, today announced that it has begun global shipments of its recently debuted and patented Beamforming Microphone Array Ceiling Tile (BMA CT) to systems integrators. Further simplification comes from the array’s built-in power amplifier, which allows each array to drive two 10-Watt, 8-Ohm loudspeakers. The BMA CT also features ClearOne’s proprietary adaptive steering technology (think of it as smart switching). This provides impeccable room coverage while eliminating the need to adjust individual beams. Integrators can daisy chain ceiling tiles via P-Link (ClearOne’s proprietary peripheral link) for larger conference setups – for simpler wiring and longer distances compared to networked home-run connections. P-Link also allows integrators to daisy chain additional peripherals such as wireless mics, USB Expanders, and GPIO Expanders. The system supports all of this functionality with zero consumption of analog I/O and signal processing in the DSP mixer leaving those resources available for other needs. With the ability to daisy chain up to three ceiling tile microphone arrays, with a maximum of 650 feet (200 meters) between each array, a single, low-channel count CONVERGE® Pro 2 mixer can support multiple rooms with a total cable reach of 1950 feet (600 meters). ClearOne’s Pro CONSOLE® software greatly simplifies setup, eliminating the need for separate configuration and programming of switches, microphones, audio networks, and DSP mixers. It also uses auto discovery to detect all connected BMA CTs and P-Link peripherals. “The BMA CT delivers powerful features with powerful benefits. Simply put, the ClearOne architecture just can’t be beat,” says Hakimoglu. The BMA CT is available in three sizes: 24-inch, 600mm and 625mm, to fit common ceiling grid sizes. Featuring a white grille, the tile blends in to a standard ceiling and becomes nearly invisible.